The final results of the Ukrainian presidential election May 25 will be published on June 1, but the basic outcome is clear. Petro Poroshenko won roughly 55 percent of the vote, a solid victory (as expected) that took him past the 50 percent threshold needed to avoid a second round. 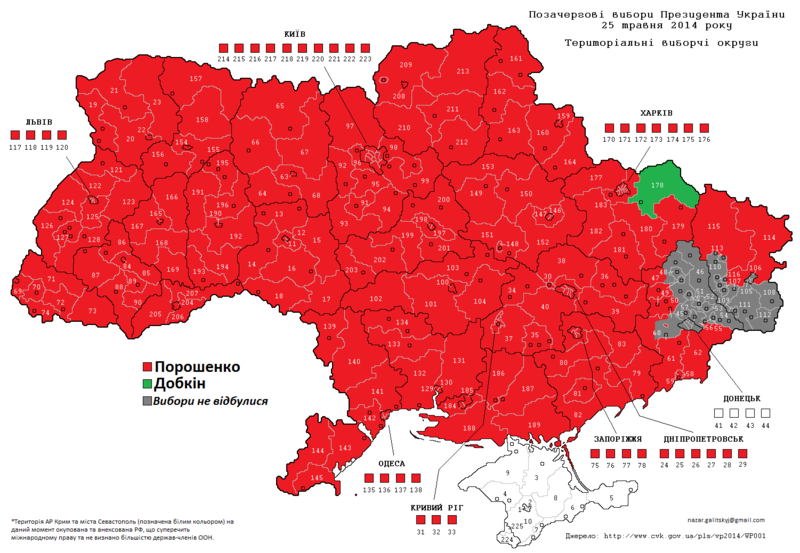 Moreover, as per the map below, electoral support for him was relatively evenly distributed across the country – he came in first in all electoral districts in which voting took place (that is, excluding Crimea and parts of the Donbas) except one. That district, to the east of the city of Kharkiv, was won by Myhailo Dobkin, Kharkiv’s former mayor and candidate of the Party of Regions, although nationally Dobkin came in third overall with only three percent of the vote. That said, the generally positive outcome of the election may have been a necessary condition for political stabilization in Ukraine, but it is hardly a sufficient condition. Nor should the results be interpreted as unequivocally positive for the political stabilization of the country. So let me identify “three goods” and “three not-so-goods” from the results. 1. Support for Ukraine’s territorial integrity. The outcome suggests reasonably strong electoral support for Ukrainian unity across the country. At roughly 60 percent (excluding those areas where voting was impossible), overall turnout was rather less than expected, but it was very respectable by historical and comparative standards, particularly given the disruption of the electoral process in much of the Donbas. The OSCE’s report on the conduct of the election concluded that it was “largely in line with international commitments and with a respect for fundamental freedoms in the vast majority of the country.” Even in electoral districts in the east and south outside the Donbas, turnout was respectable. Moreover, while the separatists prevented voting in 16 of Donetsk’s oblast’s 22 electoral districts and in 10 of 12 electoral districts in Luhansk, 15 percent of the electorate in those districts in Donetsk where voting stations were open and 39 percent of the equivalent in Luhansk managed to cast a ballot. 2. Support for moderation and pragmatism. While the EuroMaidan movement may have been driven mostly by opposition to corruption and a rejection of Ukraine’s political establishment, the electorate was effectively denied an opportunity to vote for a revolutionary, charismatic new political face from the Maidan movement – on the model, for example, of Mikhail Saakashvili in Georgia after the 2003 Rose Revolution. Instead, they were effectively given a choice among various establishment figures, extremists, and political neophytes. In my view, that is a good thing. Poroshenko has considerable political experience and represented himself as a moderate and a pragmatist. He stressed in his campaign (not entirely convincingly) that he would do his best to combat corruption and bring a new kind of politics to Kyiv. He also made an effort to appeal to voters in the east and to Russians and Russian speakers. Above all, he indicated that while he wants Ukraine to become more “European” and to join the European Union, he also emphasized that he is interested in at least reducing tensions with Russia. Most importantly, he came out in opposition to NATO accession and in favor of some kind of institutionalized neutrality for Ukraine. Also helpful was the victory in the Kyiv mayoral election of Vitaly Klitchko, the boxing champion, Maidan participant, and leader of the UDAR party, as was his earlier decision not to run for president. Finally, the gracious concession speech by Yulia Timoshenko, who came in a distant second in the presidential voting with 13 percent of the vote, was also a good thing. I would venture to suggest that a gracious concession speech after a mostly free and fair election for national leadership is a pretty good indicator of the institutionalization of electoral democracy in any country. 3. A bad day for Svoboda and Pravy Sektor. Particularly helpful for the political stabilization of Ukraine, given Moscow’s claims about a “fascist junta” having taken power in Kyiv, was the very poor showing by Oleh Tyahnybok, leader of the ethnonationalist Svoboda party, and Dmitry Yarosh, leader of the more-or-less neo-fascist paramilitary group Pravy Sektor. Tyahnybok received a mere 1.16 percent according to the preliminary results, and Yarosh even less, at 0.7 percent. 1. Turnout and the persistence of the east-west political gradient. 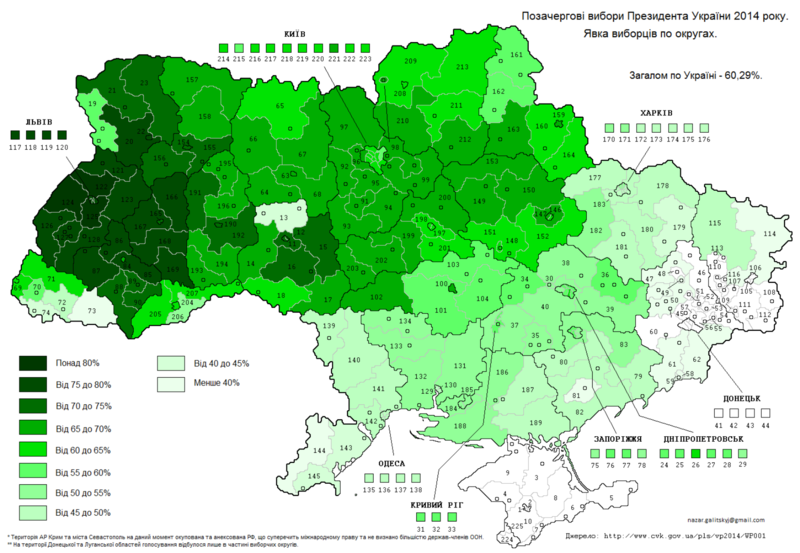 While Poroshenko managed to come in first in all electoral districts but one, it is not the case, as one tweet I read claimed, that the election marks “an end of electoral division of Ukraine.” As the map below shows, turnout varied dramatically across the country, and it was much higher in the west, thereby replicating the long-standing east-west electoral gradient. In the west, turnout was very high, peaking at 78 percent in Lviv. In central Ukraine, it ranged from at 60 to 65 percent. In the south and east, turnout was surprisingly high in Dnipropetrovsk (56 percent) and respectable in Zaporizhia (51 percent). More worrisome for the central government was turnout in the key regions of Kharkiv (the capital of which is Ukraine’s second largest city), at 48 percent, and in Odessa, where it was 46 percent. 2. A less-than-complete rejection of the right. While Tyahnibok and Yarosh have been the bêtes-noire of the Russian media, voters who support a more forceful response to Russian pressure, separatism, and the annexation of Crimea had another candidate to vote for. Oleh Lyashko, leader of the Radical Party and a deputy in the Rada, has called for the death penalty for traitors, spies, and deserters. He is also the political leader of one of the pro-Maidan paramilitary groups now active in the east. Lyashko came in third, with eight percent of the vote, while his Radical Party came in second in Kyiv’s city council elections. If one adds Lyashko’s vote to Tyahnibok’s and Yarosh’s, what might be called the militant anti-Russian faction received around 10 percent of the vote in the presidential election. Given the circumstances, my view is that that is a surprisingly low figure. 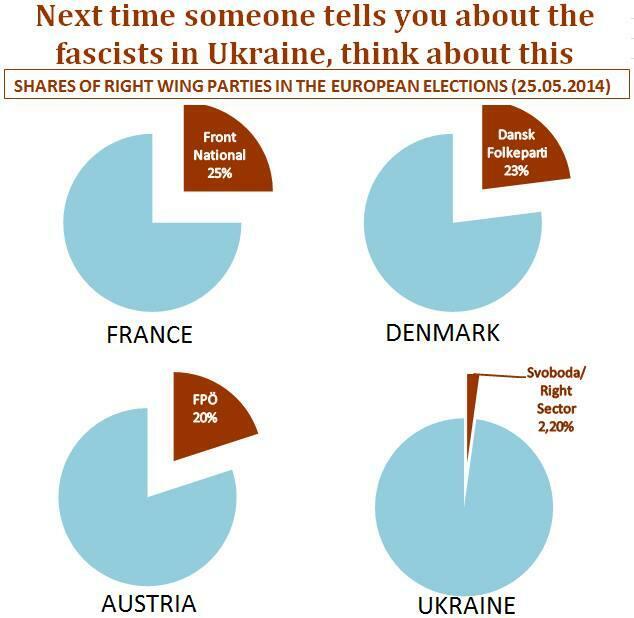 Moreover, as the following chart suggests, and as I have argued in earlier posts, support for the far-right in Ukraine is less that it is in many West European countries, Hungary in particular. 3. Poroshenko the unsavior. That Poroshenko is not a charismatic revolutionary is, as I suggested above, a good thing. Nevertheless, it is also true that he brings a good deal of baggage with him, and it will be particularly important, and difficult, for him to demonstrate (assuming that his campaign platform in fact reflects his preferences) that he is genuinely committed to less corrupt, more transparent, and more responsible governance in Ukraine. The “Chocolate King” is, after all, one of Ukraine’s richest oligarchs, and he has a political record that smacks of opportunism. He was an early supporter of the Viktor Yushchenko and the Orange Revolution of 2004, but he subsequently served as a minister in Yanukovych’s government. Moreover, not only is he the owner of the Roshen Confectionery Corporation, he owns the television station “Channel 5” as well, and he has indicated that he does not intend to sell it (a position that I hope international lenders convince him to change). Finally, the Russian newspaper Kommersant (perhaps the most independent and professional of Russia’s newspapers) went through WikiLeaks and turned up cables and reports indicating that American diplomats felt that Poroshenko was in effect a self-interested opportunist and that there were “credible allegations of corruption” against him.